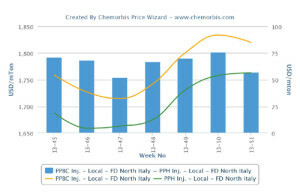 According to ChemOrbis, players operating in African markets including Kenya, South Africa and Egypt have started to receive new import PP and PE prices for June cargoes. The new offers came in line with the players’ expectations. Prices from the Middle East indicate increases from May levels but the hike amounts are not as large as they were back in May. Increases are reported at around $20-80/ton while one Middle Eastern producer elected to roll over their prices to Egypt. Previously, snug supplies out of the Middle East were supporting the producers in their hike attempts despite poorly performing demand. This month, although the availability issues continue, players in Africa generally report seeing some improvement on supply levels. In Kenya, a buyer who received $50-80/ton hikes from a Saudi Arabian producer for HDPE film and blow moulding noted that overall trading activities are still very weak in Kenya while adding that the current supply levels are exceeding the demand. According to this buyer, July prices will emerge at lower levels. Meanwhile, another Kenyan converter reported receiving $20-40/ton hikes from the same Saudi producer for both PP and PE and that he received Brazilian PPBC injection offers for June. “The Brazilian offer is more competitive and it is offered on a longer payment term. However, we find it risky to commit to this material given its long shipment time since the July expectations already center on decreases,” he further added. According to this buyer, overall demand is slow after the June price hikes and weak demand is likely to result in discounts on deal levels. In South Africa, a trader operating in Johannesburg, reported that they received new June offers from a major Saudi Arabian producer with $30/ton hikes for HDPE and LLDPE film as per ChemOrbis pricing service. “The Saudi producer appears to have relatively higher quotas, but their LLDPE and HDPE film supplies still seem to be restricted. Meanwhile, demand has given signs of improvement, but it is mostly down to the still rather limited supplies. We lack a clear view for July,” he added. 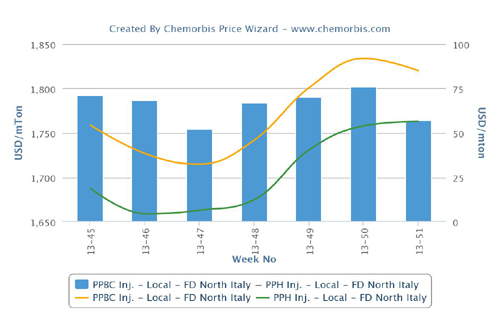 In Egypt, Middle Eastern producers’ prices indicate rollovers to increases of up to $50/ton, according to ChemOrbis. However, a major Saudi Arabian producer’s PP offers are trading at a premium, of around $50/ton, when compared to the offers they give to Kenya. Considering this, Egyptian players anticipate some downward adjustments or discounts on PP deals. Regarding supplies, some report seeing slightly improved availability while some note that supplies are still generally limited but there is no severe tightness felt given weak demand. Liquidity issues persist in the market while impending Ramadan is another factor that weighs down on the sentiment as trade is expected to be slower.